Saved Segments are a great way to avoid re-running the same query to look for newly matched constituents over & over again. If you find yourself running the same filter set on multiple occasions, why not save the segment and save time? EverTrue will then do the work of notifying you if any new matches surface! When you want to re-run a saved segment, just look under "Segments" in the left-side menu. Don't see your saved segment? 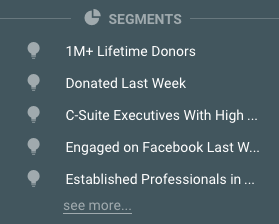 Click "see more..." to open up Your Segments, in addition to seeing our Featured Segments. Learn more about both Lists and Segments in our training webinar here!